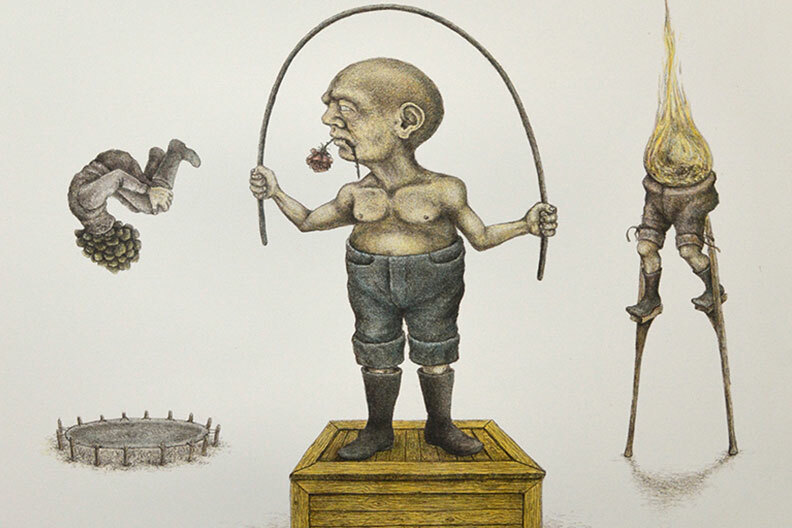 Michael Barnes is a master printmaker with a passion for the medium of lithography. The theme of his work addresses, in part, the absurdities of life and calls into question the historical evolution of so-called civilization. Elmhurst College will host Barnes’ exhibition Many Turns and Feats to Bewilder from Jan. 29 through March 17 in the Frick Center, Founders Lounge. A public reception for the artist will be held from 4:30 p.m. to 6:30 p.m. on Wednesday, Feb. 14. Admission is free to the exhibition and reception, and the public is invited. As a social critic, Barnes is part of a long tradition of visual artists whose works provide a critique of society. A professor of printmaking at Northern Illinois University, he has exhibited his work worldwide. This exhibition is one of about a dozen art shows that Elmhurst College hosts each academic year in two campus venues. In addition, the College’s A.C. Buehler Library permanently houses the College’s unparalleled collection of Chicago Imagist and Abstractionist Art, which explores the vibrant, often outrageous, yet precisely crafted works of Chicago artists between 1950 and the present. For more information, please contact Suellen Rocca at (630) 617-6110 or srocca@elmhurst.edu.